SOCHI, Russia -- Four days after being praised as a hero for helping Russia win its first gold at the Sochi Olympics, Evgeni Plushenko on Friday was taking criticism for dropping out of the men's figure skating. Plushenko's strong performance in the team event brought wide accolades for his determination to overcome injury. But on Thursday he withdrew before the men's short program, complaining of severe spinal pain during the warmup. If "felt like a knife in my back," Plushenko said afterward of his warmups injury. Plushenko was Russia's only men singles skater in Sochi. He won the slot in a closed exhibition skate that cut out Maxim Kovtun, who beat him in the Russian nationals. Among his critics was longtime rival Alexei Yagudin, the 2002 Olympic gold medal. He told the R-Sport news agency he supports "people who go to the end." "I think Zhenya will understand my words," he said, using the familiar version of Plushenko's name. "We always competed through the pain." "You should go when it's time," Ruslan Nugmatullin, a former Russian national soccer goalkeeper said on Twitter. "Kovtun earned the right to participate in Sochi2014." Alexei Urmanov, the 1994 Olympic gold, suggested that Plushenko's hubris backfired. "It's on the conscience of Zhenya, the team and the federation," he was quoted by R-Sport. 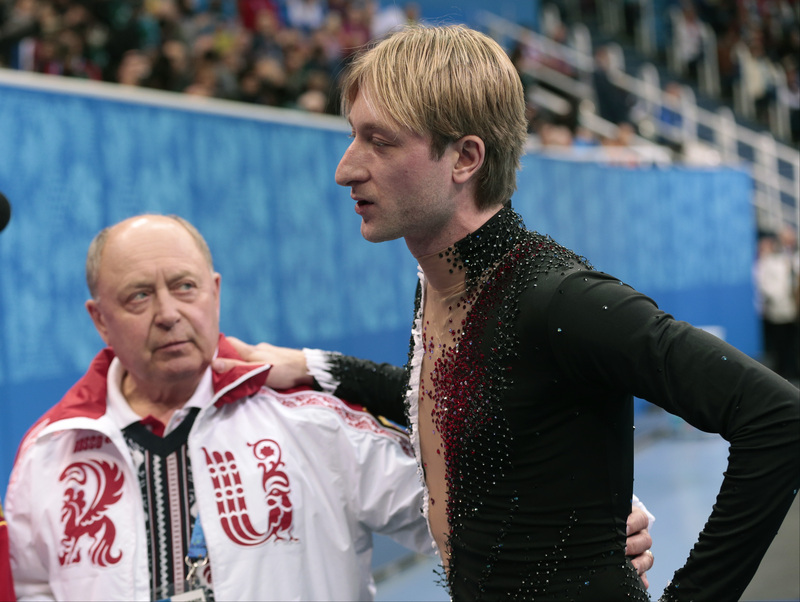 To some politicians, Plushenko's withdrawal was a blow to Russia's national pride. "Perform through the pain for the honor of the country," Igor Lebedev, a parliament member from the nationalist Liberal Democrats, said on Twitter. Elena Vaitsekhovskaya, the figure skating correspondent for Russia's Sport-Express newspaper, seemed weary not only of the intrigue behind Plushenko's selection but also of the appearances of his flamboyant wife, Yana Rudkovskaya, in the mixed zone to support him. "All of this was reminiscent of an incompetently directed stage show," she wrote. "It became harder and harder to sympathize with the athlete." "The one-man show in Sochi has concluded. Real sport has begun," she said in the newspaper's Friday edition. "After Sochi, the federation will have to answer for its choice," nationalist lawmaker Vladimir Zhirinovsky said. However, many of his peers say he should be remembered for his achievements, even if things ended on a sour note because his withdrawal left Russia without a skater in the event. "His longevity was unbelievable, on a par with the greats of so many sports, not just figure skating," said Evan Lysacek, who beat Plushenko for the gold medal four years ago in Vancouver. "He was intense and always a tough competitor. I was so impressed that he stuck by this comeback and the way he handled the team competition and was able to win a gold medal. "I don't think he's pleased this is the way for his career to end, but the pain was just too much."